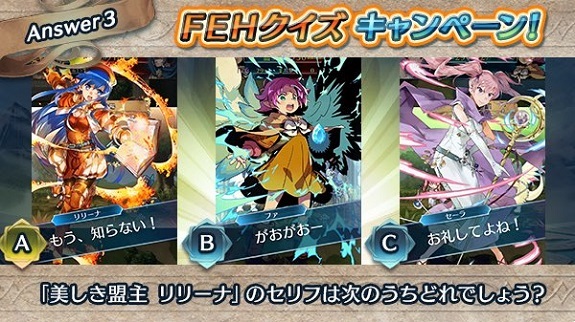 In order to promote Fire Emblem Heroes during the Golden Week, Nintendo and Intelligent Systems have launched the second Quiz Campaign for the game. 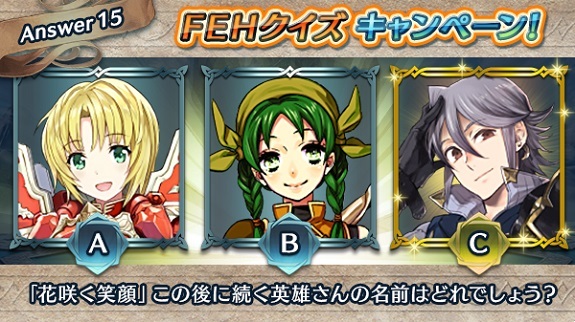 It works just like last time: players will be asked various questions via Twitter, and if the answer with the most votes is the right one, it will be counted as correct. This time around, there will be 18 questions over the course of 10 days (2 questions each day). 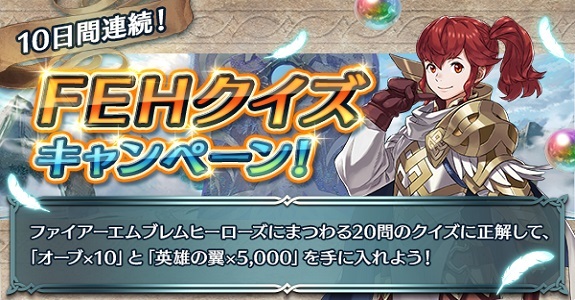 If players get the right answer to all the questions (they have 24h for each one), then everyone (even those who didn’t participate) will receive 10 Orbs and 5 000 Hero Feathers as Special Log-in Bonus! Unfortunately, it doesn’t look like Nintendo is going to provide official English translation of the questions, so we’ve made this post! It will be updated regularly, as soon as new questions go live. You can vote by the Twitter embeds below! 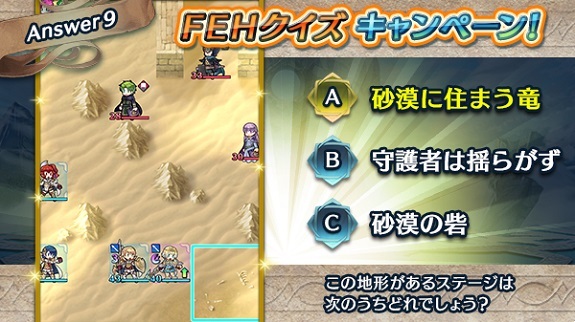 This second Quiz Campaign for Fire Emblem Heroes runs from April 27th to May 6th. The rewards will be delivered to all players as Special Log-in Bonus at an unspecified date, once the campaign is over. Correct answers from players: 20/20. 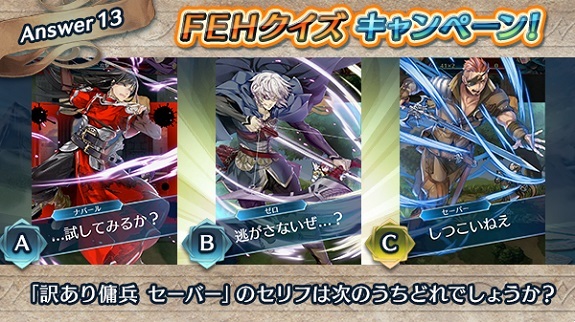 Question: Which of the following is the Dire Thunder? Question: Which of the following Hero is referred to as “The Dragon That is Called A God”? Question: Listen to the voice samples below. 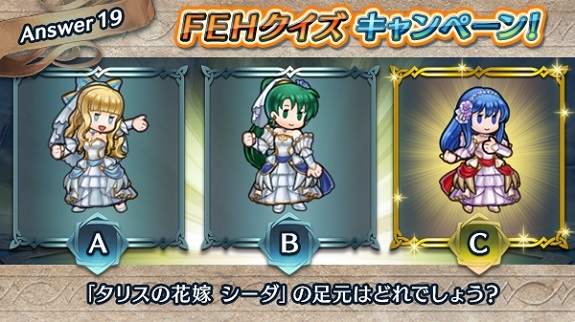 Which of the following lines is actually said by Lilina? Question: Look at the picture below. 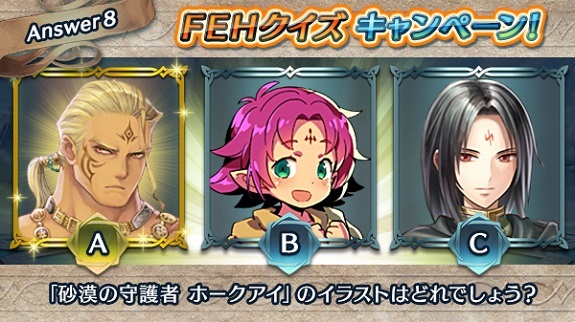 Which haircut is Owain’s? Question: Look at the picture below. On which map from Book I of the main story can the terrain shown in the picture be found? Question: Look at the video below. What kind of recovery staff has this kind of effect (with beautiful feathers)? Question: Look at the picture below. Which haircut is Nino’s? Question: Look at the picture below. Which tatoo is Hawkeye’s? Question: Look at the picture below, that shows a desert area. Which map from Book I of the main story is it from? Question: Look at the picture below. 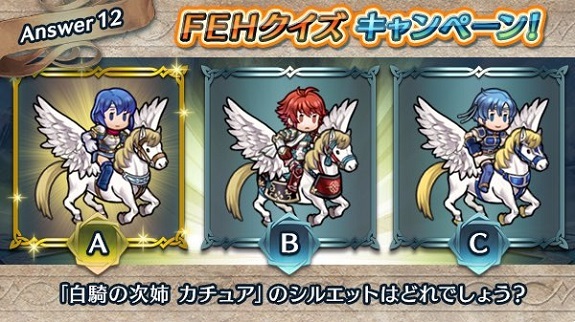 Which Pegasus belongs to Caeda? Question: look at the picture below. 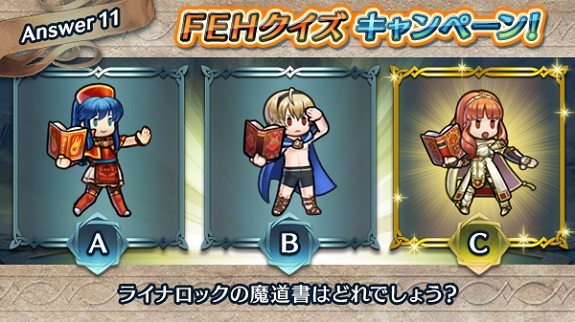 Which one of these Tomes is the Ragnarok? Look at the picture below (and pay particular attention to the hair). 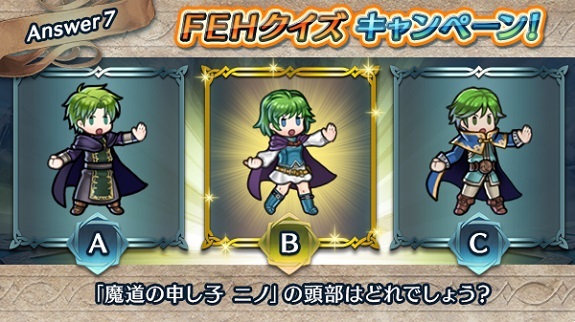 Which silhouette is Catria’s? Question: Listen to the voice clip below. Which line is said by Saber? Question: Look at the picture below. 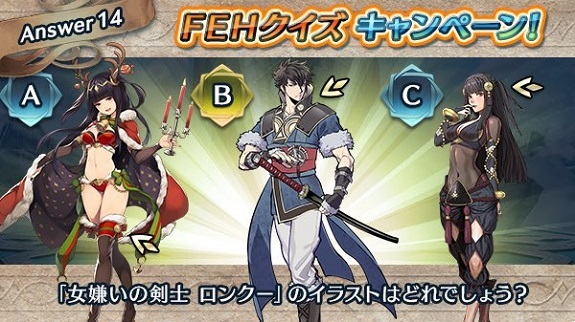 Which picture shows Lon’qu’s outfit? Question: Which Hero is referred to as the “Dancing Duelist”? Question: look at the picture below (and pay particular attention to the hairstyle). Which silhouette is Julia’s? Question: look at the picture below. 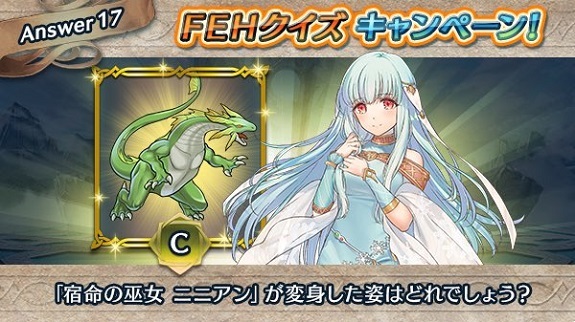 Which Dragon is actually Ninian transformed? Question: look at the picture below. 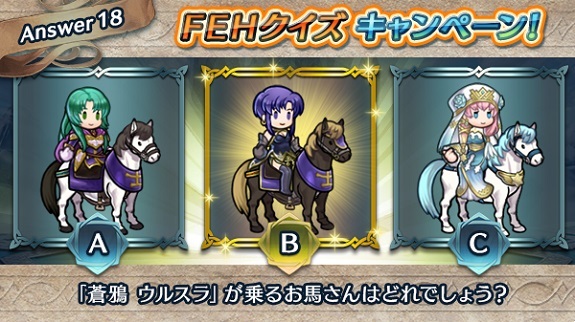 Which horse belongs to Ursula? Question: Look at the picture below. 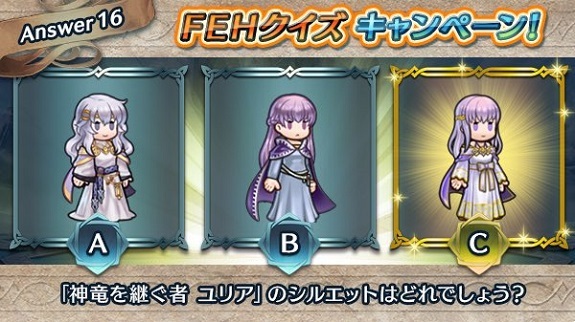 Which feet are Caeda: Talys’s Bride’s? Question: Look at the video clip below. Which type of magic tome is shown in that video clip? 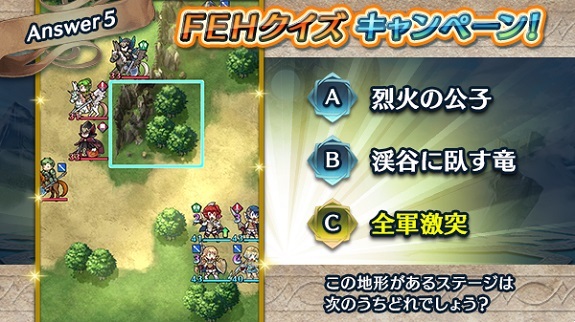 Question 1: Which of the following is the Dire Thunder? Question 2: Which of the following Hero is referred to as “The Dragon That is Called A God”? Question 3: Which of the following lines is actually said by Lilina? 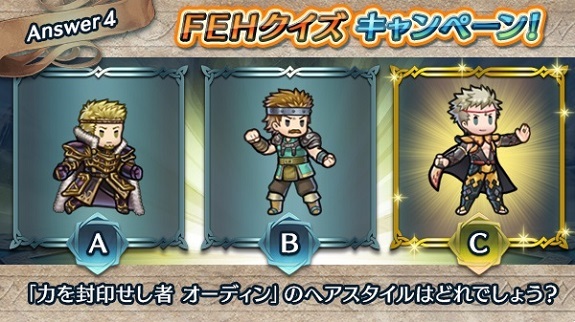 Question 4: Which haircut is Owain’s? Question 5: On which map from Book I of the main story can the terrain shown in the picture be found? Question 6: What kind of recovery staff has this kind of effect (with beautiful feathers)? 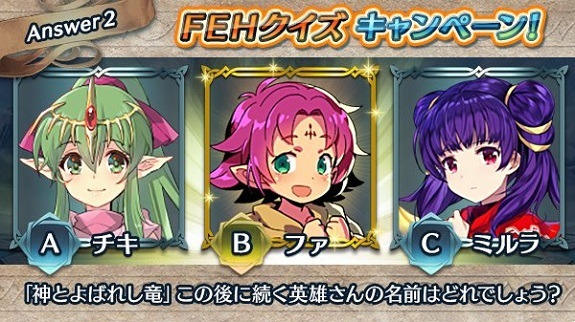 Question 7: Which haircut is Nino’s? Question 8: Which tatoo is Hawkeye’s? Question 9: Look at the that shows a desert area. Which map from Book I of the main story is it from? 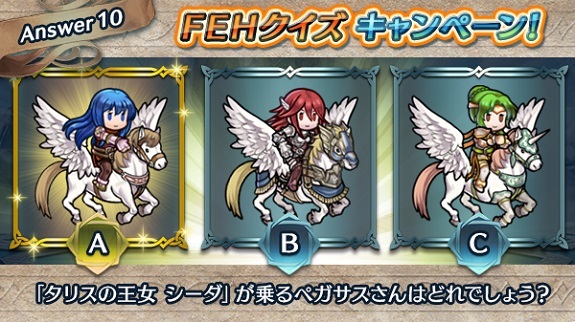 Question 10: Which Pegasus belongs to Caeda? 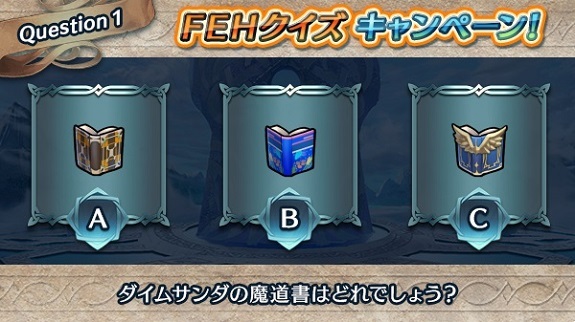 Question 11: Which one of these Tomes is the Ragnarok? Question 12: Which silhouette is Catria’s? Question 13: Which line is said by Saber? Question 14: Which picture shows Lon’qu’s outfit? Question 15: Which Hero is referred to as the “Dancing Duelist”? Question 16: Which silhouette is Julia’s? Question 17: Which Dragon is actually Ninian transformed? 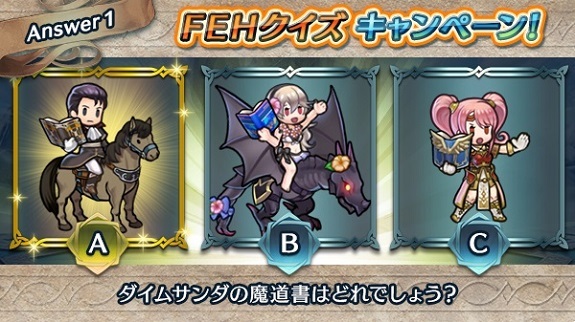 Question 18: Which horse belongs to Ursula? Question 19: Which feet are Caeda: Talys’s Bride’s? Question 20: Which type of magic tome is shown in that video clip? As usual, keep an eye out on the Events and Content Updates and Characters page to keep up to date with all that’s happening in the game!